Children are much more accepting of things they understand. If a child has never seen a picture of a giraffe or a zebra, they will be shocked when they first go to the zoo. If, on the other hand, they have colored pictures of and read stories about giraffes and zebras – that are so different from the cats and dogs they are used to seeing – they will have a better understanding of them and have a better experience interacting with them. My Friend with Autism explains what autism is, and why kids with autism do the things they do. This book empowers children by helping them understand and accept children with autism. With 1 in 150 children having autism, all children need this information – to understand their classmates, their cousins, the kid down the street, their own brother or sister. This book also gives the child with autism a great resource to better understand himself. The included CD contains printable pages from the book, which the child can give to friends, to explain the child’s behaviors. The CD provides black and white versions of the book pages, as well as useful resources for adults, such as Page-By-Page Discussion Guidelines, 12 Behaviors that May be Suggestive of an Autism Spectrum Disorder, 10 Quick Strategies for Helping a Child with Autism, and more. 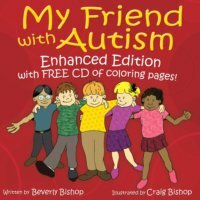 Written by an autism mom and illustrated by an autism dad, My Friend with Autism, enhanced edition, portrays the real world of life with autism by people who have walked this path. Copyright 2011 SpecialNeedsAlmanac.com All rights reserved.